Devi Lawson might be one of the chosen few gifted with divine magic to defend the earth from demons, but she's never been particularly good at following orders. After leaving the celestial guild behind following her partner's death at the hands of a demon, she struck out to hunt netherworld creatures alone. After all, it's what she does best. But now a demonic killer is targeting other celestials, and they need Devi's help to find the culprit. Not only is she being labelled as a potential suspect, but the methods the killer uses are awfully familiar to her. To gain vital information, Devi is forced to ally with an immensely powerful warlock whose magic is entirely too close to the demons she's hunting, and who knows things about her past that nobody else does. If word about her dealings with the netherworld makes it back to the celestials, Devi will get a one-way ticket to jail at best -- a death sentence at worst. 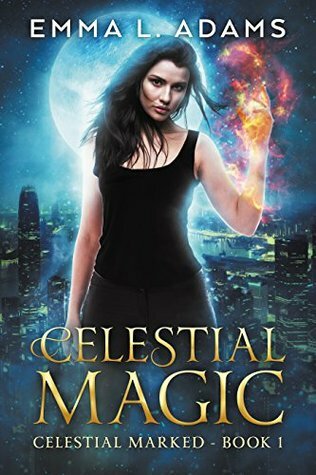 Celestial Magic was a random book I downloaded because I recently got Kindle Unlimited, and I wanted to fill my subway commute with something to read. Once I started reading, I was pretty much hooked. Devi is pretty awesome. She's a Celestial, which means that she holds heavenly power and the ability to fight and kill demons. But, when her partner mysteriously dies, she leaves her job behind and starts doing freelance work for the paranormal community. To start, I like that Devi put her foot down in the first place and didn't let the Guild intimidate her after her partner's death. Devi is very headstrong throughout the whole book, and I loved that she didn't let anyone get in her way. From the moment he was introduced, I knew who the love interest would be. (I won't spoil that, though.) But, I'll admit I was confused as to how that progressed. I didn't feel that there was a true romantic build up, although that may be for the best since this book didn't strike me as a romance novel. It was urban fantasy first, with emphasis on the action and suspense, and the romance was an undercurrent. I really, really loved the fantastical world that Adams created which was essentially overlaid with the human world. The trope of "angels and demons" and "demon hunters" is a bit tired at this point, but I didn't find myself feeling that way about Celestial Magic. I was intrigued by the Celestials and the dynamics of what that meant for the magical world. Overall, I'd highly recommend Celestial Magic! It was a quick read, I finished it in about a day and a half. You can purchase Celestial Magic on Amazon as a Kindle copy (available on Kindle Umlimited! ), or a paperback. Emma is the New York Times and USA Today Bestselling author of the Changeling Chronicles urban fantasy series. Emma spent her childhood creating imaginary worlds to compensate for a disappointingly average reality, so it was probably inevitable that she ended up writing fantasy novels. When she's not immersed in her own fictional universes, Emma can be found with her head in a book or wandering around the world in search of adventure.